We need you to comment – The proposed change to public charge will impact millions of immigrant families. The Trump Administration has proposed regulation that would dramatically broaden the “public charge” test that has been a part of federal immigration law for decades. These proposed changes would drastically reduce access to green cards and various types of visas for immigrants. These proposed changes put money ahead of family and threatens to worsen hunger, poverty, and unmet health and housing needs. “It is the neediest in our community who will be affected. 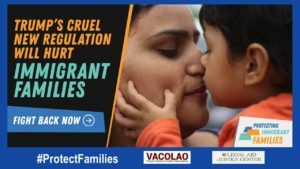 Immigrants will not apply for public benefits like Supplemental Nutrition Assistance Program (SNAP), Temporary Assistance for Needy Families (TANF), or Medicaid. These programs provide basic necessities for families. Without these programs, immigrant’s families will go hungry, go without basic medical care, and endure hardships that unnecessary. This is a reckless decision on behalf of the Trump Administration.” Says Monica Sarmiento, Executive Director for the Virginia Coalition for Immigrant Rights. The rule is open to public comment from October 10, 2018, to December 10, 2018. VACIR encourages all of the member organizations and Virginia residents to submit a comment in opposition to this proposal. We will update this page with additional information to help you write and submit a comment.